I spent a while looking for the *right* interior pieces for my Argosy. I found some and some of them arrived today! I decided when I started thinking about outfitting my motorhome that I would go as old school as I possibly could. I guess some would call it vintage. I might agree with that term on some of the things I ordered, however my initial goal was to do my best to avoid Chinese items and keep the products older and therefore, in my mind, safer. Made in America was, and still is, a priority. I decided to search Etsy first. If you don’t know of this gem of a site, I advise you become familiar. So many cool things come out of Etsy. My second search was on Ebay which was actually a success as well, much to my surprise. I was surprised at the prices on most of the stuff I got. The flatware ended up being the most expensive – at $75 for a 40 piece set that was made in Japan with a pattern I am familiar with from some time in my past. The least expensive piece was a garlic press at $4.75 that was made in America and won’t rust. My color scheme, if you haven’t seen my other blog post, involves red, grey, white, black. So I was basically searching based on those colors and what I know I might need – the usual – serving bowls, flatware, mixing bowls, plates, platters, pots & pans etc. 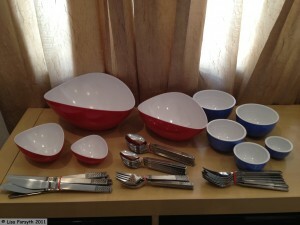 I found lots of stuff.. one thing doesn’t match the rest but I really liked them and wanted them anyway. So, here are the pretties! Love the shapes of the red bowls, which all nest! 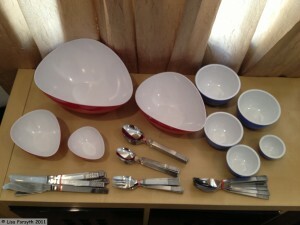 The flatware is in perfect condition! The blue bowls.. yes, I know they don’t match but like I said I love them and I wanted them and they are measuring cups which stack as wellI got an extra bonus from the person who sent me the bowls. Turns out they were sent from Maine and I also received a vintage postcard of a moose at Rumford Wild Animal Park & Campgrounds, Rte 2 Rumford Point, Maine. I think I will try to find a place for the postcard in the Argosy. My favorite piece that I ordered was this one. 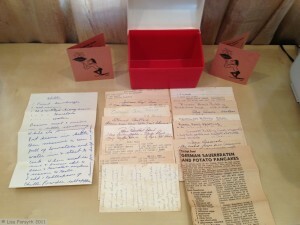 It came complete with a bunch of handwritten recipes from quite some time ago – I intend on using it to hold all the recipes I like to cook.. my recipes will join these older ones in the little red box. It just makes me smile. The person who sold it to me had taken great care to wrap the cards in heavy duty paper and tied it all up with a piece of twine. I love Etsy. Now I have to wrap it all up tight and put it into storage for a few months. I am still waiting on a few other bits and I will be excited to see them as well! Yea, that was a lucky find!